Order just a Standard Size with your credit card, then we will begin your order immediately! We are happy to introduce this new set of armor to our lineup. Featuring a Zunari, or "human head-shaped" kabuto, here is your chance to own one of the most popular helmet styles amongst the warlords of Japan's Sengoku Jidai (Warring States Period). Even those not as well versed in Japanese history may find this kabuto familiar, as it is said to be the design inspiration behind the helmet of Darth Vader. This Yoroi's Okegawa style body armor was also highly popular throughout this turbulent time of Japanese history, as it was specifically engineered to defend against the emerging threat of firearms. The matching helmet and body armor are both handcrafted by our skilled artisans out of riveted, black lacquered iron, and come with navy lacings with scarlet accents. 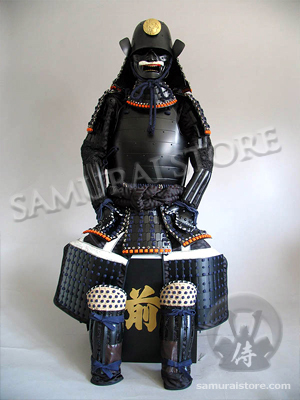 This imposing, wearable Yoroi consists of the parts and accessories listed in the tables below. Your armor will also come in a beautiful, black lacquered wooden storage box that will double as a stand when you wish to display your Yoroi.